...remarkably delicious, unbelievably easy, homemade pizza (I cheat with the base, but don't tell anyone!). It's cheaper, tons tastier, and a lot healthier. Come Friday we all look forward to winding down after a jam packed, work filled week. I have to say though, I think our 8 year old is the one who loves getting to the end of the week the most. Pizza is his absolute all time favourite food, and this particular pizza is at the top of his list. And he has another reason for loving Fridays... You see, during the week to motivate my 8 year old to do chores around the house, and to get things done like homework and so on, he has a points chart. It's like a star chart, but for big kids. He loves it, plus it makes my week that bit easier! As he's a huge rugby fan it's based on the same scoring format - anything to make jobs seem like fun! For every chore he gets 3 points, and for everything else he scores a try. The 'everything else' category can be anything like helping his brothers, using his initiative or trying his best - things that Mum and Dad feel deserves extra points on the chart. If he hits a certain amount of points by the end of the week he gets to stay up late, watch a movie and eat treats (generally the chocolate kind!). Now you know why he loves Fridays so much. For this recipe use the highest quality pizza bases you can find. The pizza bases I use, and believe are the best, happen to be made by an Irish company - Pizza Da Piero. Eccellente! What I love most about this meal is that you can add whatever toppings and ingredients you like. Keep it simple for the kids, and for the grown ups you could try some crumbled blue cheese, anchovies or sliced chillies (perhaps not all on the same pizza!). 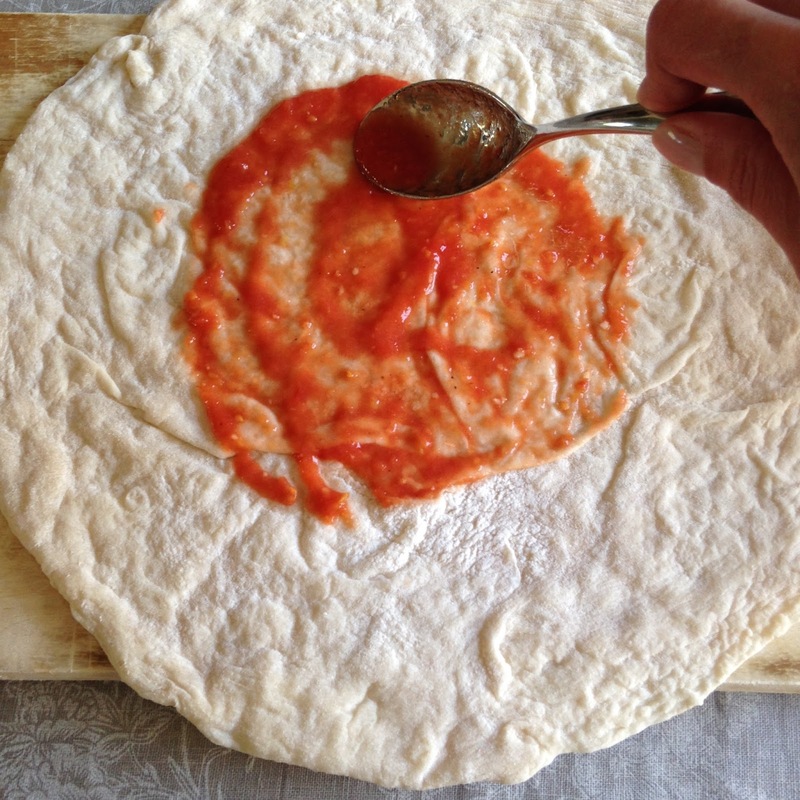 Start off by making your pizza sauce. Open the tins of tomatoes and pour off any juices. Pop the tomatoes in a food processor, add the garlic, salt and pepper, and whizz until smooth. That's it, possibly the easiest tomato sauce in the world to make! Next place your first pizza base on a large chopping board. Spread with a couple of tablespoons of the sauce and sprinkle on approximately 100g of grated mozzarella. Slide the pizzas, two at a time, directly onto the oven shelf (not a baking tray) for 4-5 minutes until the cheese and base are starting to bubble. The pizza on the lower shelf may take a minute or two longer. Carefully remove the hot pizzas one by one back onto the chopping board and spoon on some of the pesto and slices of buffalo mozzarella. Pop back in the oven for 2 minutes until the mozzarella has melted and the pizza is golden. This homemade pizza, made in your own kitchen, is honestly as close as you'll get to the deliciously thin, flavourful pizzas found in the best pizzerias of Italy. The youngsters - mozzarella and pesto, as in above recipe. 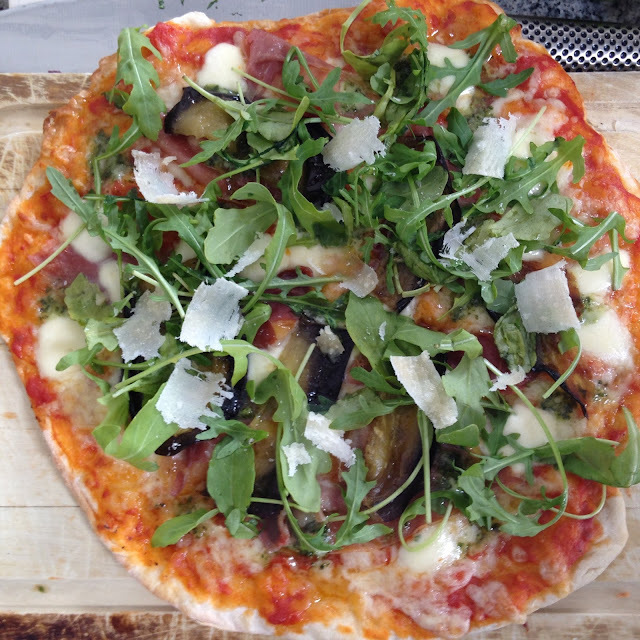 The grown-ups - these days our favourite toppings are sliced roasted aubergine, parma ham, pesto, rocket and Parmesan shards.